Jack Dromey, MP for Erdington, officially opened Compass Support’s state-of-the-art new all-weather pitch in Birmingham recently (Friday 27 October), thanks to a grant from the Premier League & The FA Facilities Fund, which is delivered by the Football Foundation. 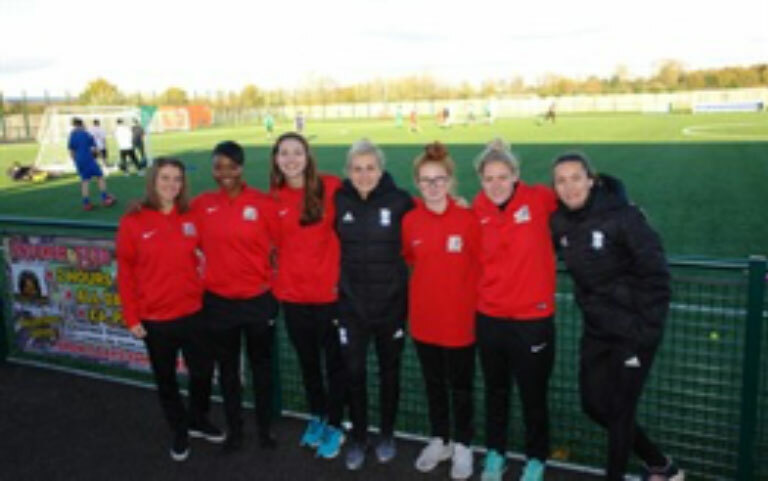 Birmingham City Ladies FC players Emily Westwood and Emma Follis, who have both represented England, were also in attendance. The grant has enabled Compass Support to upgrade the existing grass pitch at the Castle Vale Stadium, with a brand new third generation (3G) artificial grass pitch (AGP). The brand new playing surface will benefit a variety of users, including: partner clubs Castle Vale Town FC and Romulus FC; Castle Vale Concords FC; Castle Vale Olympic FC; Greenwood Academy and the Compass Youth Service. The new facility, which is on the original site of the Castle Bromwich Aerodrome – a major World War I and II airfield – will be used by the Birmingham FA to deliver a number of coaching and referee training courses. Additionally, Aston Villa FC plan to deliver Premier League Kicks sessions and other community outreach programmes there. Compass Support worked alongside the Birmingham FA and the Football Foundation to compile a five-year Football Development Plan, which is a vision of how sport will be played on site with an emphasis on increasing participation. Previously, partner club Castle Vale Town FC could only play their matches at the stadium. As a result of the brand new pitch, the club will be able to move all of their training to the facility which will allow them to offer their players safer and more effective training. Thanks to this, a 105% boost in football participation across all ages is expected at the site. This is supported by the club’s plans to introduce 19 new teams, taking their total from 15 to 34 – including six brand new female sides. A new youth disability football team will also be established, as well as a number of Under-18, Under-21 and senior sides. This is as part of the club’s efforts to strengthen player pathways through junior football and into the senior game. Compass Support and Castle Vale Town FC worked in partnership with the Birmingham FA to secure a £687,100 grant from the Premier League & The FA Facilities Fund, delivered by the Football Foundation. Compass Support has also received two previous grants through the Foundation, totalling £19,875, towards upgrading the Castle Vale Stadium. In addition, the Pioneer Group and Castle Vale Endowment Trust Fund have contributed over £150,000 towards the upgrade. Since 2000, the Football Foundation Funding Partners’ investment has provided 388 grants worth over £21.4m towards grassroots sports projects worth £49.9m across the whole of Birmingham. “My thanks go to Compass Support for kindly inviting me to unveil their new all-weather pitch. It’s great to hear what a positive impact the new facility is going to make for the clubs that use it, and I was especially pleased to hear that a 105% increase in football participation is expected at the site. “This is a fantastic addition to existing community facilities in Castle Vale. A large number of people, both in our neighbourhood and across the North-East of the city, will gain enormous benefits from the sport development opportunities at grassroots level which this new state-of-the art 3G pitch offers. “The Premier League & The FA Facilities Fund provides the investment necessary to improve grassroots football facilities. So, I am delighted to see Compass Support join thousands of local clubs and organisations who have reaped its benefit, in this case through the opening of a new 3G AGP. I’d like to thank Jack Dromey MP, Emma Follis and Emily Westwood for taking the time to officially unveil the facility.